We’d love your help. Let us know what’s wrong with this preview of Pieces That Fit by Karen MacNeill. "Pieces That Fit is a powerful story based on one woman’s struggle to raise an autistic child. Karen’s raw, emotional candor will move you throughout your reading experience. Karen began this journey during Autism Awareness month in April 2014, when she wrote a post a day for thirty days. She received so much love, support, and encouragement from those posts that she is no "Pieces That Fit is a powerful story based on one woman’s struggle to raise an autistic child. Karen’s raw, emotional candor will move you throughout your reading experience. Karen began this journey during Autism Awareness month in April 2014, when she wrote a post a day for thirty days. She received so much love, support, and encouragement from those posts that she is now sharing her journey, hoping to reach a bigger audience so that others may have a better understanding of their own journey and struggles. 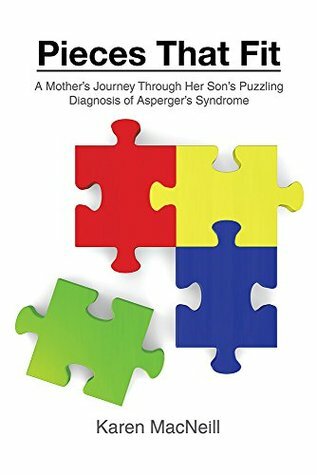 She hopes this book will be a message of hope to others who have struggled or are struggling with this puzzling diagnosis. The book begins with Karen meeting her husband, Jim, in 1990 and moves on to the birth of their son, Chandler, who is afflicted with Asperger’s syndrome. Karen describes in detail her frustrations, anger, and bitterness through the ordeal of having Chandler diagnosed. She takes her readers through difficult situations, tantrums, and tears in a uniquely honest and moving way. From frustrating meetings with teachers to even worse day-care experiences, you will find yourself rooting for this boy and his family to succeed. In between, Karen and Jim have another child, Braeden, who couldn’t be more different than his big brother, and new challenges begin to emerge. With a new brother, however, successes begin to mount for Chandler. Finally, Karen brings us a message of hope as Chandler grows up and learns to live with the autistic traits that are uniquely his. As Chandler finally begins to succeed in school and in life, you will be cheering and fist-pumping in support of him." To ask other readers questions about Pieces That Fit, please sign up. This is a great book about what it is like to struggle with a child diagnosed with Asperger's syndrome. It does not tell you what to fix. It does not tell you what you should do. It simply provides a message of hope that these kids CAN have successes in life. This is important because many parents raising a child with this type of diagnosis feel that they (parent and child) will never have a "normal" life.